A delicious topping for breakfast treats or ice cream. Pour mixed berries and orange juice into medium saucepan. Cover and cook on medium heat until fruit is soft. Add sugar, nutmeg, and salt and stir well. Cook for about 15 minutes to mix the flavors – watch the pan as the sauce has a tendency to boil over, making a sweet, sticky mess! 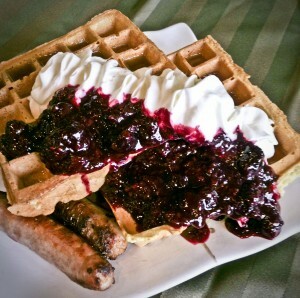 Serve warm over waffles, pancakes, french toast or as a dessert topping on ice cream, cakes, or pies. Or cool and mix with yogurt or as a sweet addition to crackers and brie.